1/4 cup white sugar brown sugar works too. 1 Marinate the salmon: Mix the soy sauce, sake, mirin, ginger, garlic, black peppercorns or red pepper flakes and sugar in a medium bowl. Place the salmon fillets in a sturdy freezer bag. Pour the marinade into the freezer bag with the fish. Seal the freezer bag and place in a baking dish (so that if the bag leaks it doesn't get all over your fridge). Place in your refrigerator and chill at least an hour, preferably several hours. 2 Simmer marinade, reduce by half: Remove the salmon fillets from the marinade. Place the marinade in a small saucepan and heat it until it simmers. Simmer it for several minutes or until the sauce has reduced by half. 3a Grilling method Brush the grill grates with olive oil; pre-heat your grill to medium heat. 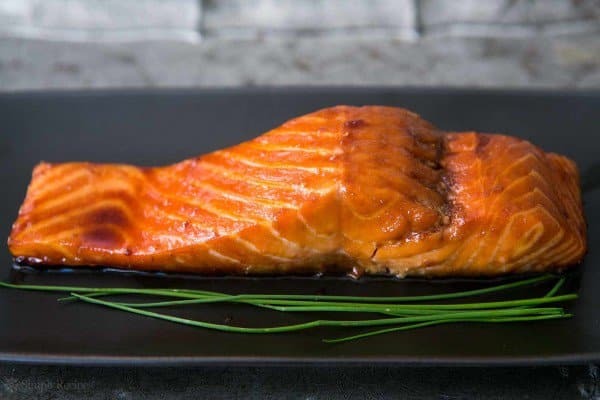 Place salmon fillets on a piece of aluminum foil (brushed with olive oil) over the grill grate, skin side down. Brush the salmon with the marinade glaze. Cover the grill. Cook the salmon 6-10 minutes (depending on thickness of the fillets), brushing again with the marinade halfway through the cooking, until the salmon is just barely cooked, and easily flaked with a fork. 3b Pan frying method Heat a few tablespoons of olive oil in a skillet over medium-high heat. Fry the salmon 3 to 4 minutes per side, basting frequently with the marinade. Serve once the salmon is just barely cooked through and is easily flaked with a fork. 3c Baking method Preheat oven to 350°F. Line a baking dish with aluminum foil. Brush the top of the foil with olive oil. Place salmon on the foil, skin side down. Brush with marinade. Bake for 10-15 minutes depending on how thick the fillets are, basting frequently with the marinade, until the salmon is barely cooked through and is easily flaked with a fork.